To verify the yield and quality of alfalfa harvested from production fields over the life of the stand beginning with the first production year (year after seeding). To quantify decreases in stand productivity of alfalfa fields as they age. This summary has now reached a milestone with ten years of project data. Once again, UW-Extension agents were asked to identify forage producers who would be willing to weigh and sample forage from a 2015-seeded field and continue to do so for the life of the stand. A total of 7 fields from 3 different farms were enrolled in the program in 2016. 19 fields continued from previous years. The current summary includes data for the first, second, and third production years from fields entered into the program in 2014 through 2016 (2013-2015 seedings). There are no fourth-year stands remaining in the project, though there have been several in previous years. As is always the case in these types of studies, there is some attrition of fields over time. This is either because the farmer decided to terminate the field because of declining productivity or critical yield or forage quality data for a cutting or multiple cuttings could not be obtained. This year there were 4 fields dropped from the project that participated in 2015. Production data was collected for 26 fields in 2016 with a total of 6,740 dry matter tons of forage harvested, weighed, and sampled from 1,529 acres. A summary of all project fields (current and past) is presented in Table 1. The growing season overall was above average in terms of temperature and precipitation in most areas of the state. Similar to previous years, this varied across the state and though the season. Many areas had normal temperatures with dry conditions in early spring, leading to quick greenup, rapid growth, and an early first cut. However, by early June, regular and sometimes flooding rains started and persisted through the summer. This made timely harvest and drydown challenging. First cutting again varied widely with some fields being harvested the week before Memorial Day at high quality and others being delayed two weeks or more. Despite the wet weather and flooding, the southern part of the state stayed extremely dry through much of the summer. Late summer and autumn saw above average temperature and rainfall. Many fields were not harvested after mid-late August because of wet field conditions or the producers did not need additional forage. These stands had better than normal fall growth and went into the fall looking good. New seedings had a tough year. Planting was generally timely, but cool and dry conditions in early May slowed growth and allowed disease to thin stands. Wet fields, especially those with previous tillage, had noticeable wheel traffic damage. The growing season overall was very close to normal in terms of temperature and precipitation for many areas. Some areas were cooler and drier in early summer, but this balanced out in late summer. September was the warmest on record for many places. Significant winterkill and heaving affected eastern and central areas of the state. The spring was mostly dry and warm, which resulted in timely planting and rapid alfalfa growth in May. First cutting varied widely with many fields being harvested the week before Memorial Day at high quality and others being delayed one to two weeks because of heavy rains that started on Memorial Day weekend. Some of these delayed fields caught up and still had four cuts while other only had three. Many stands had good fall growth and went into the fall looking good. For the second consecutive year the growing season began with cool, wet weather. Both planting and crop development were delayed. Alfalfa harvest finally began the end of May and continued through mid-June. Heavy rains fell at the beginning of June in much of the state. Wet conditions also delayed the second cutting, often causing forage quality to be lower than desired for feeding dairy cows. Growing degree units remained below normal for much of the summer, though fields eventually dried for a timely third and (in some cases) fourth cutting. Many of the northeast Wisconsin project fields had fourth cut harvested in mid-September. Overall, the growing season could be characterized as being cool and wet. Project fields were identified and an accurate measure of field size was determined (if not previously known). Forage yield from an entire project field was weighed (usually this was done with an on-farm drive-over scale). Both empty and full weights for all trucks/wagons used were recorded. Beginning in 2008, two forage samples from each harvest were taken and submitted to the Marshfield Soil and Forage Analysis Laboratory (only one sample was submitted per harvest in 2007) for NIR analysis. Data from the two forage samples was averaged and recorded into a spreadsheet by the local coordinator. The data was then shared with the producer following each harvest. At the end of the season, all data was collected and summarized for this report. Mean cutting dates by year are presented in Table 2 and cutting dates for all project fields harvested in 2016 are presented in Table 3. The 2016 season was marked by near average harvest dates for first-cut (Table 2). This became progressively earlier though the season with fourth-cut being 10 days ahead of average and the second earliest after only 2012. Average first-cut date has ranged from May 16th in 2012 to June 10th in 2013. Regardless of first-cut date, the average fourth-cut date is generally within a week of September 1st, with the exception of a few extreme weather years and 2016. The large majority of fields in this study and in 2016 were cut four times. Across years and sites, 21 fields were cut three times, 151 fields were cut four times (generally prior to or soon after September 1st), and 22 fields were cut five times (generally four times before September 1st with a final cut in October). First cut date had a 33 day range (May 18th to June 20th) (Table 3). Typically, first cut occurred over 19 days because of varying location and weather. This ranged from 13 in 2007 to 45 in 2015. Six of the fields were cut before or during Memorial Day weekend. The majority were cut the last week on May and six were cut in June. Throughout the season, cutting date was affected by frequent rain and wet soil. This also contributed to wide ranges in subsequent cuttings. For the second year in a row, Central Wisconsin was greatly impacted by wet weather. Without the Marathon county data, the cut window would have been 24 days and average cut dates would have been 3-4 days earlier. Four fields were cut 3 times this year and one was cut three times plus an October cut. One field was cut 5 times by September 1st. This was the 6th out of 22 times that a 5th cut occurred prior to October 1st. When fourth cut was the final cut, the date spanned from August 9th to September 1st. Alfalfa was harvested as haylage for all but 17 individual cuttings over the ten years. Harvest dry matter data from the dry hay harvests was not included in the forage dry matter data means. Although project participants are not asked about storage structure, there is good reason to believe most of the farms are storing this forage in bunkers, piles, or bags. Throughout the duration of this project total season dry matter percentage of harvested forage has ranged from 40 to 50 percent (Figure 1), though individual cuttings and total-season field means sometimes exceeded 50 percent, especially later in the season. It’s been questioned if this is too dry for obtaining optimum storage porosity in a bunker or pile. The trend has been toward lower dry matter percentages in recent years. For 2016 the average dry matter across all cuttings was 44 percent; however this ranged from 36% to 50% with two fields at each end of the range. It’s unclear if this was purposeful or if it is simply attributable to environmental conditions. Seven fields finished the season with total-season dry matter means under 40 percent. Average yield by cutting and for the season in each project year are presented in Figure 2. The highest average dry matter yield per acre of 5.0 tons was in 2007 and 2010. A record low total-season dry matter yield average was set in 2013 at 3.7 tons per acre. In 2016 the average yield across all fields was 4.72 tons per acre, which was the third highest year and 0.28 greater than the ten-year average of 4.44 tons per acre. First-cut yield of 1.8 tons per acre was tied for highest, matching 2010 and 2015. This was likely because good spring growing conditions and delayed harvest in several fields. Second-cut yield was the highest since 2010 at 1.2 tons per acre. The third-cut average yield of 1.0 tons per acre was slightly above average. Fourth cut yield of 0.8 tons per acre was at the average. The fifth-cut yield of 0.8 tons per acre was the record for the program; however it is only from one field and the data set is limited. Detailed yield data for each field by year are presented in Appendix A. Once again there was extreme variation between fields in 2016 (Figure 3). Yields ranged from a high of 6.1 to a low of 3.4 tons per acre. One field exceeded 6.0 tons per acre which has been the benchmark for top yields in the study having now been reached 10 times over 10 years. The highest yielding field since the project’s inception was 6.55 tons per acre in 2012. In contrast, there were 9 fields that did not reach 3.0 tons per acre (Appendix A). 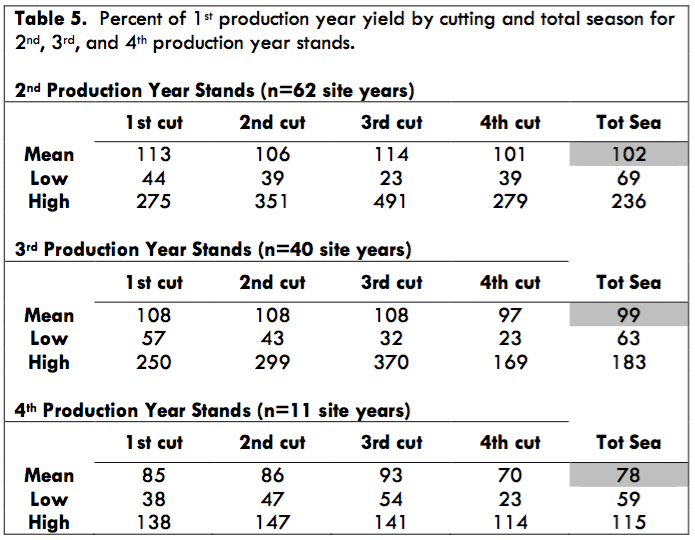 In-season: An analysis was done to determine the percent of total season yield for each cutting (Table 4). Data was summarized for 3-, 4-, and 5-cut systems for all project years. 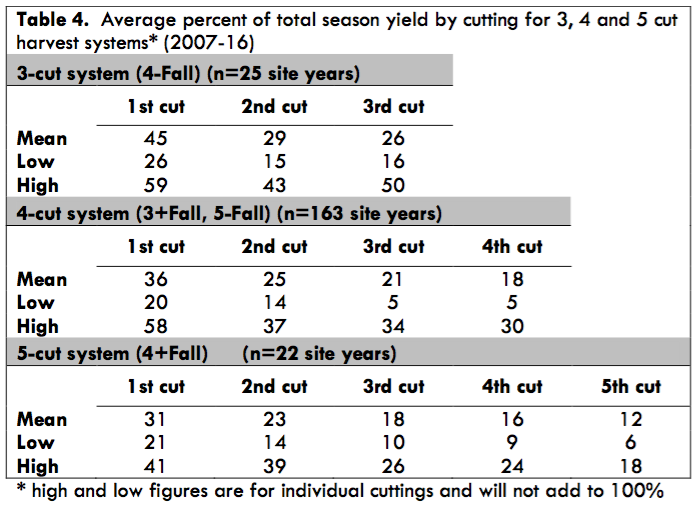 Five-cut fields were also included in the 4-cut summary with the final fall harvest not included in the total season yield. It’s significant to note the wide variation in percent yield for an individual cutting. In some cases this is the result of environmental conditions (e.g. drought) previous to the harvest while in other situations it’s simply a function of cutting date (Tables 2 and 3). Between years: Persistence is influenced over time by the age of the stand, cutting schedule, and environment. For this project, persistence is being measured as a percent of 1st production year dry matter yield. Persistence data in Table 5 consists of 2006 through 2015-seeded fields and is averaged over all cutting schedules. Although ranges indicate a wide variation, average forage yield in the 2nd and 3rd production year have been comparable to the 1st production year. The yield for 4th-year stands drops to 78 percent of the 1st-production year. Time will tell if these trends continue, but to date it appears that keeping stands for at least three production years seems to be the prudent decision. The lowest mean crude protein percent (20.2%) obtained in the ten-year study. Every cut was either the lowest or second lowest seen. The previous low was 20.4% in 2010 (Figure 4). This was the third year in a row with low crude protein. Highest average NDF percent for first, fourth, fifth cut and the total season mean (40.9%). Other cuts were in the top three or four (Figure 5). The previous high was 40.7% in 2015. This was the fourth year in a row with high NDF. Overall, NDFD percent was fairly consistent across cuts and at a high level (Figure 7). There was a drop at third cutting, but not as much as most previous years. A similar consistency was observed in 2015. Mean Milk/Ton for the first cut was the second worst seen in 10 years (Figure 9). However, the other cuts were above average. The season total of 2,899 lbs/tn was the second best seen after 2007, which was 2,973 lbs/tn. Crude protein, NDF, and RFQ could be tracked over time because first cut was extended each of the past two years. A regression shows the CP dropped 0.22 – 0.24% per day, NDF increased 0.54 – 0.57% per day and RFQ decreased 2.9 – 3.1 points per day as harvest was delayed in 2015 and 2016 (Figures 10-12). These numbers are similar to the expected change of -0.25%/day for CP, slightly more than +0.41%/day expected for NDF and slightly less than -4 to -5/day expected for RFQ. The Wisconsin Alfalfa Yield and Persistence Program is designed to provide forage growers and agricultural professionals a unique look at what is happening at the farm level. As more fields are entered and years pass, the reliability of information continues to increase. Environmental conditions have had a profound influence on both yield and quality with no two years being exactly alike. First and foremost, UW-Extension Team Forage wishes to thank the producers who took the extra time and effort to obtain weights and forage samples for the project fields at each cutting. Funding for this project has been provided by UW Extension Team Forage and the Midwest Forage Association (MFA). This report was written and data compiled by Mike Bertram, Superintendent, UW Arlington Agricultural Research Station and Jason Cavadini, Asst. Superintendent, UW Marshfield Agricultural Research Station. Questions may be directed to: mbertram@wisc.edu or jason.cavadini@wisc.edu Reports from 2007-2014 were written by Mike Rankin, Emeritus Crops and Soils Agent, Fond du Lac Co. Appendix A. 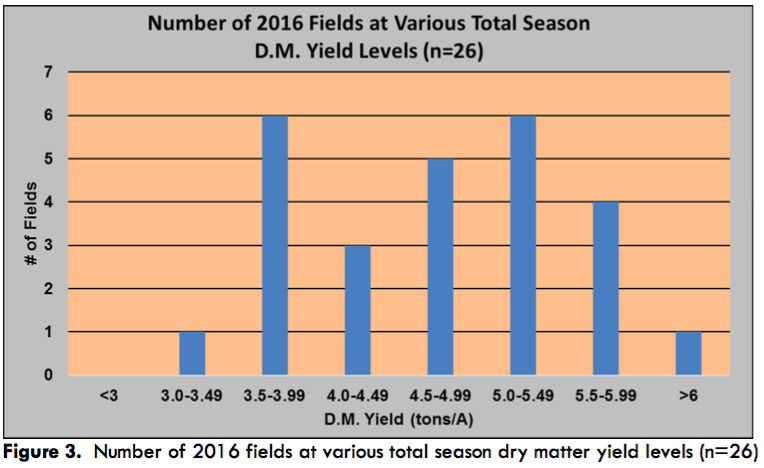 Dry matter yield by field, harvest year, cutting, and total season.